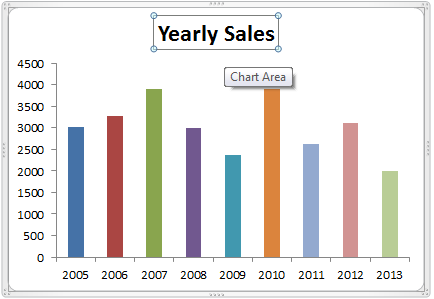 Chart title background color in Excel - ANALYSISTABS - Innovating Awesome Tools for Data Analysis! We will see how to change the background color of the chart title in this topic. We can change the chart fill color to match with the chart colors. We can use chart formatting tools to change the chart fill color. Now we will change the chart title background color in Excel using an Example chart. Follow the below steps to change the chart fill color. 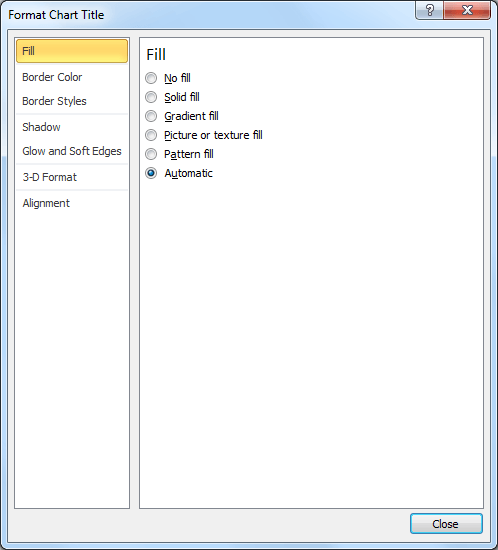 The first step is to select the required chart title to change the fill color. 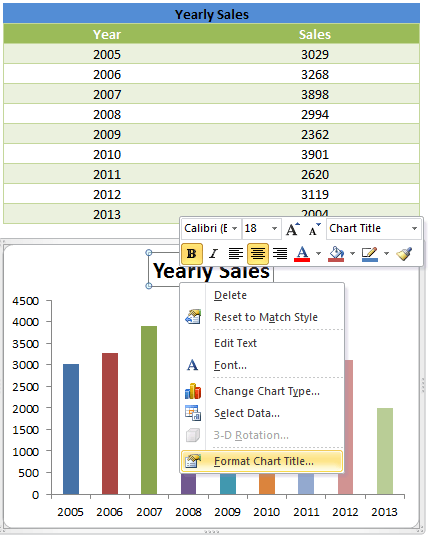 Here you can see the screen-shot showing how to select a chart title in Excel. Right click on the chart title, now you can see the quick format bar and chart title properties menu. Select the ‘Format Chart Title’ option from the chart title properties menu. Now you can see the ‘Format Chart Title’ tool. We can use the this tool to format and change the fill or background color of the chart. Now you can change the fill color option to Solid Fill and choose a color from the Fill Color tool. 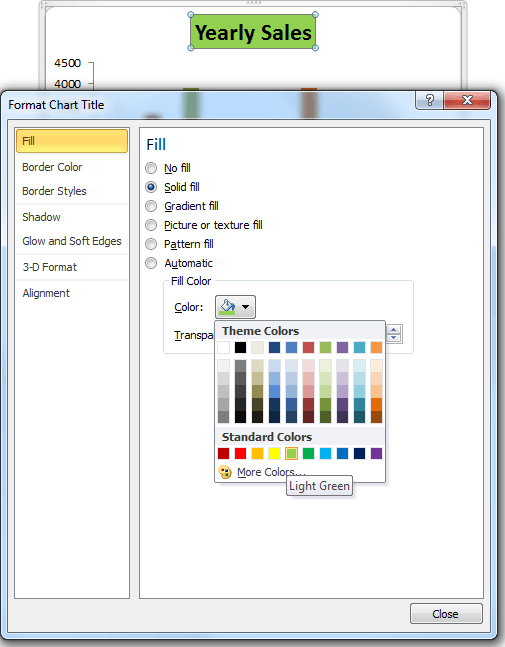 No Fill: ‘No Fill’ color option of Chart title will not fill any background color to the chart title. Solid Fill:’Solid Fill’ option of Chart title will provided the option to fill the solid background color to the chart title. Gradient Fill:’Gradient Fill’ option of Chart title will provided the option to fill the gradient background color using more than one color to the chart title. Picture or Texture Fill: ‘Picture or Texture Fill’ option of Chart title is provided for setting a picture as a chart title background. Pattern Fill: ‘Pattern Fill’ option of Chart title is provided to set a pattern to the chart background title. Automatic: This is the default fill color option for the chart title background. This will change the fill color based on your Excel template.